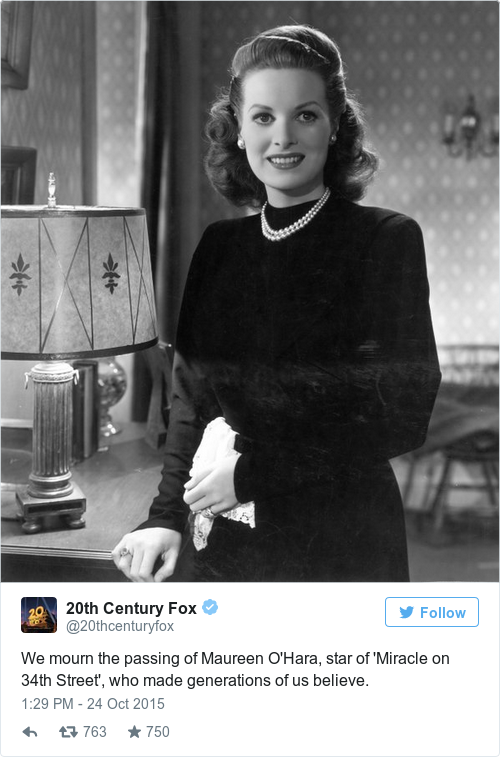 ONE OF IRELAND’S true Hollywood greats died yesterday and tributes have been paid to Maureen O’Hara from all over the world. The actress’s roles are some of the most iconic of her era and her striking features made her image one of the most memorable among her peers. But despite her global profile and her dual Irish-US citizenship, her loyalty and love for Ireland never waned and since her death many have been speaking of just that. A Dubliner by birth who spent many years in Co Cork, O’Hara’s roots have been celebrated in the last 24 hours. Among them, author Roddy Doyle who paid tribute to her proud Dublin background on his Facebook page. Email “"I was Irish. I remain Irish." - Maureen O'Hara's loyalty to her roots celebrated after her death”. Feedback on “"I was Irish. I remain Irish." - Maureen O'Hara's loyalty to her roots celebrated after her death”.